Here's my first project everyone. Just getting my feet wet. I'm going to start working on more soon. Please give me feedback and let me know if I need to adjust anything. I had to make a lot of adjustments to some of these as the images just were not colored right or they needed burning and contrast adjustments. PS: I've just recently installed the game and don't have all the characters. If someone could post a pic of all avatars in game, I'd really appreciate it. 1. These pictures are too different from each other. 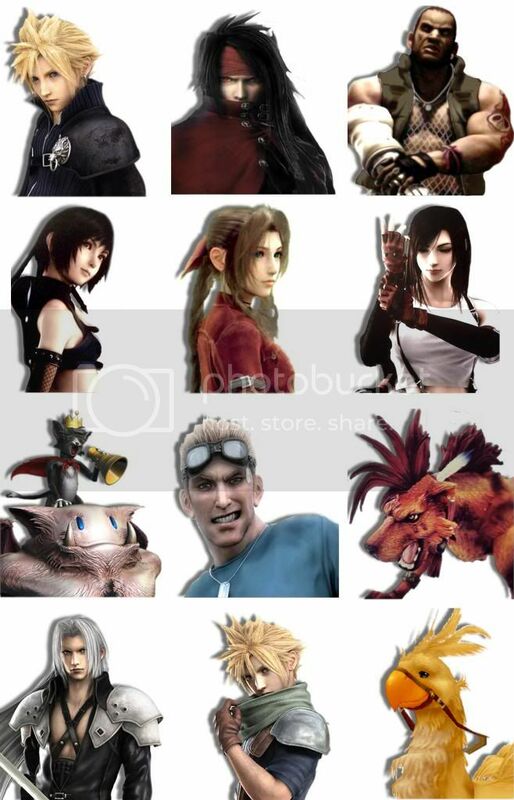 Most of them have plain backgrounds, so the few that don't (Red XIII, Cloud, Chocobo) really stand out. 2. Pics from different angles is okay, but not pics from different distances like this. For example, Vincent's got a VERY tight closeup of his face, whereas Barret is visible all the way down to his torso, with his face only taking a small portion of the frame. However you're going to frame these, it's better to be consistent. 3. Something's wrong with Cloud's face; did you stretch or squeeze this one out of its original aspect ratio? 4. There's still some huge differences between them in contrast. Barret's got very high contrast and some crushed blacks; his neck has lost almost all its detail. Cid, on the other hand, could probably use a bit more; he looks almost muted next to the rest of the characters. 5. Most of these could probably use additional color work for consistency. Each one is colored fine on its own, but as a group they look horribly inconsistent. Especially Red XIII. He may be red himself, but the additional red emanating off him from the fire is almost too much, particularly when put side by side with Cloud, Cid, or Cait Sith, who are all comprised of cool hues. 6. Cait Sith should probably have more moogle visible also. In-game, the moogle is an important part of many of Cait Sith's attacks, so it seems odd to just ignore that part of him. 7. Is that chocobo from FFXIV? They don't wear armor in this game. Overall, if I could only say one thing, it'd be focus on consistency. While these avatars largely work okay on their own, they don't really feel like they belong in a group together. You did better than some avatar sets, which occasionally go as far as to mix and match art styles (I've seen hand-drawn art and Advent Children screenshots in the same pack. ugh), but it just doesn't feel cohesive enough. 1. You don't have Young Cloud (the only one you don't have). YC has a different avatar from normal Cloud and you only see it when you have access to the Sephiroth avatar so it'll look weird. 2. Cait Sith's moogle looks like it's in a different style from the rest of the avatars. I know there's no AC rendering of said moogle, so that might be something you can't do anything about. 3. Aerith's outfit in the avatar is the outfit she wears when we meet her in CC. It's not the one in FF7. 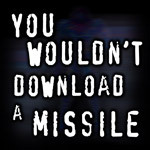 I could make the same argument about Barret, but it's close enough to what's in the game. The Aerith one you had before from AC was perfect. 1. What is the title of the file for yc, because its not in my folder so I'll have to create it from scratch. 2. Yeah the cait sith moogle is a computer rendition that was done because there were no moogle AC images (obviously ) It was the closest I could get to the concept of render art. 3. 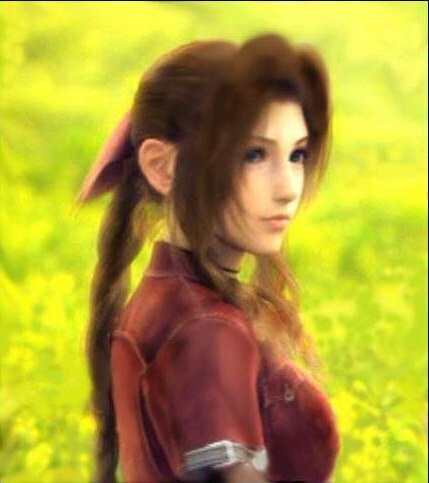 This was the best rendered image of Aerith I could find. I was battleing pose consistancy with outfit consistancy. I was also battle sleep deprivation, lol. Barret is dressed a little different in AC. Same with Cloud honestly. I am going to revisit Aerith and Barret tonight. I'm thinking of just changing the white vest to green. And this for Aerith. Of course I'll have to cut her out. I'll be doing it tonight when I get off. Look good? Your current batch is a huge improvement. I like it a lot, and it's a real step above the dozens of other AC avatar packs that've been made over the years now. You should change the color of young Clouds dress to give it more a soldier look. Ok kaldarasha. I'll see what I can do. I used him from CC since that was him from that time period. Thanks for the suggestion. How do I install this? From what I understand, your directions only work for those who use Reunion. I don't. If you have the Steam version you need to convert it first with the converter. Then you put it in the mods folder. If you have the old version you need the "Aali's driver" first. Then in the mods folder. I have the original release and I'm using Aali's driver. I assume I have to change the "mod_path" setting in the .cfg file? I already tried a few things and it's not working. What do I need to do exactly? And what is this converter you speak of? Change the mod path to 'textures', create a folder in 'mods' named 'textures', create in textures another folder called 'Menu' (if you look into the direct folder you can see how the folders has to be named) and now place the files in 'Menu'. If you have other folders in mods like bootleg or Reunion (or what ever contains textures) then you have to place all the content of it in textures. Your problem is a good example why average users shouldn't be bothered with the mod path. If we all would use an identical mod path for the textures, then we would kick out one user error. Thanks, I understand how this works now. 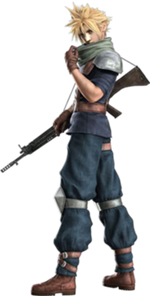 One odd thing is that Barret's avatar didn't change initially. I had to change the file name from barre_02.png to barre_00.png for it to work. _00 is the default texture (or the default pallet value). _01, _02, etc will be an alternate texture or an additional texture, but only if the game needs them. Maybe the author has changed the name to disable it for testing purpose but has forgotten to change it back. You hit the nail on the head Kaldarasha. I did that when I was having trouble with the lighting. Sorry guys. I'll get the file name changed so that nothing needs changed.